You are here: Home » Beef and Potato Stew | Carne con Papas: un platillo económico. Beef and Potato Stew | Carne con Papas: un platillo económico. Carne con papas is a Beef stew with potatoes very popular in Latin countries, usually served with rice. A meal that the whole family loves. A foolproof all time favorite! 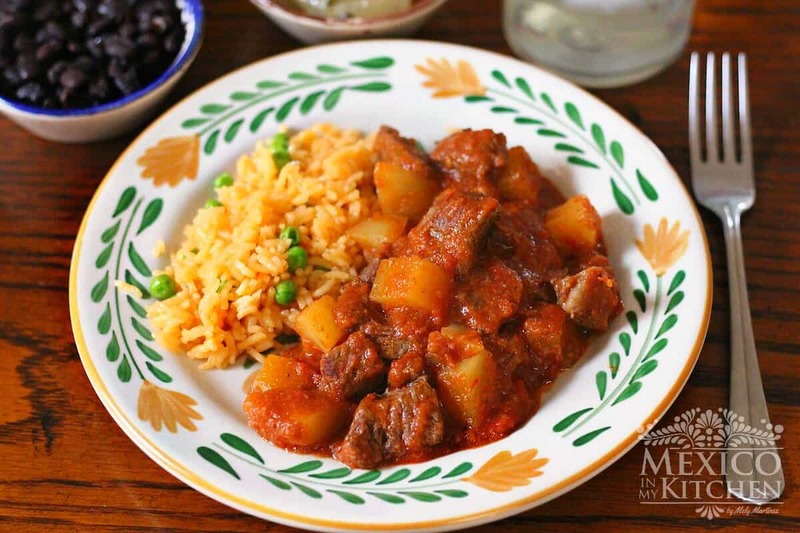 Carne con Papas ( Beef and potatoes stew) is another recipe that reminds me of my mother. As all of us know, when you are raising a large family you have to be really creative to feed them. The uncertainty in the economy makes this task sometimes challenging. But my mom always managed to use simple ingredients to prepare savory meals without spending a lot of money. Some of the easy and low-cost meals with potatoes that my mom cooked often were Picadillo, ground beef with potatoes, Cubed meat with salsa verde,Carne Guisada, Beef with Chile Colorado, Ropa Vieja, Caldo de Res. Some of those dishes used cuts of meats that are affordable like Round Steak, but she used the Pressure cooker to cook that type of meat. Slow cookers or Instant Pot were not invented yet. This is an easy way to better manage our money at home. She used to add potatoes, carrots, zucchini or chayotes to the meals to take as much advantage of the flavor of the protein of the day, either chicken or beef. Going out to eat was out of the question, just imagine going out for dinner with 8 children! Yes, those were the good old days of large families! This is a very low cost and popular meal for many families in the region where I grew up, and as I always mention, it changes from household to household. My mother makes this dish of Carne con papas using only tomatoes, but maybe her next door neighbor adds a little bit of guajillo or ancho peppers to the mix. We call it Carne con papas, or beef with potatoes. Made with some of the most economical cuts of meat, adding potatoes and tomatoes. A really inexpensive, comforting and delicious meal for your family. I really don’t know how my parents managed to raise a large family like ours, some of us went to private schools and others to public schools. In Mexico, from middle school to college, you need to buy your own books, and everyone wears a school uniform, which you have to pay for, even at the high school level. There is not such a thing as “school lunches”; no, you bring your own lunch from home. Today’s families are smaller, but still, they struggle to make ends meet. I personally believe that we should educate ourselves and our children about money management, not just at school but at home too. Well. you can here to find this delicious recipe for Carne con papas, I just wanted to add my little grain of rice about home economics in the mix. I hope you enjoy the recipe. While the meat is cooking, place in your blender the tomatoes, onion, garlic and a cup of chicken broth. Puree until you have a smooth sauce. Stir in this sauce into the skillet with the meat using a strainer or sieve. Bring it to simmering and cook covered for about 20 minutes. Add more broth if needed. Stir in potatoes and serrano peppers; cook until meat and potatoes are tender. Stirring halfway through cooking. Just before serving your Carne con papas, add the chopped cilantro. Season with salt and pepper. Serve warm with rice or warm corn tortillas. This is another recipe that reminds me of my mother. As all of us know, when you are raising a large family you have to be really creative to feed them. The uncertainty in the economy makes this task sometimes challenging. But my mom always managed to use simple ingredients. Season beef with salt and pepper. Heat oil in a large skillet or casserole over medium-high heat until shimmering. Add meat cubes and cook until browned on all sides. About 10 minutes. Just before serving, add the chopped cilantro. Season with salt and pepper. Serve warm with rice or warm corn tortillas. If you don’t have Chicken broth, substitute with 1 cup of water and 2 teaspoons of chicken bullion. The pepper can also be blended into the sauce if you prefer to have the dish a little spicy. You can use other herbs like oregano, Bay leaves or thyme instead of cilantro to season this meal. The Mexican Version for Carne con papas is very similar to the Cuban, Venezuelan, Philipino or Puerto Rican recipes. And, I guess countries like Honduras, Colombia and El Salvador, have their own version. That sounds so delicious! I will try it as best I can with what I have on hand. Thank you, Mely. One way I save money with food is to keep stocked up and only buy when things are on sale. When I find a good sale, then I buy a lot of something, and usually that will last until another good sale comes along. One of our grocery stores here is fairly expensive, but they do have good sales, so, for the most part, I only go in there to take advantage of the sales, buying other things at other stores. It is good to keep a "price book" when you write down what you typically need for food and other items, and then make a note of the prices in the various stores. That way, you can buy at the best price. Of course, you need to keep it up to date. When it is time to prepare supper, I first look in the fridge and/or garden to see what needs to be used up. I cook from that first. Great use for a chuck roast. We did one last weekend as shredded beef for tacos – so good! I'll have to try this recipe during a cold snap because this reminds me of comfort food. Nice post! This stew may be inexpensive to make, but it sounds very tasty. (I grew up on Gulyás, the Hungarian beef stew, also simple, tasty, and inexpensive). As far as financial sanity, the principles we live by are 1) do not spend more with your credit card than you can pay off at the end of the month – do pay it off at the end of every month. 2) We don't have to have every new thing that comes out – we still don't have smartphones, don't replace our car frequently. Choosing to be content with what we have saves us a lot of money. How many potatoes? Recipe ingredients don't list it. Hello Ginger, thank you for bringing this up to my attention. They had been added to the ingredients list. I never would've thought to use a blender in order to add some ingredients. I wish I came up with this myself 😉 Thanks! This sounds like a very tasty dinner to make. Could I replace the entire tomato ingredients with tomato sauce instead and if so how much of it? Thanks! If you prefer to use tomato sauce, use about 2 cups of it. PrincessDisney I made this recipe a& used tomato sauce & and a small amount of tomato paste, It was Dilicioso!!! Thanks Mely My Grand Mother used to make this when i was younger It was one of those recipes of hers that got lost over the years, eating it brought back a lot of Child hood Memories of My "Nana Aurora"
My meat didn't get tender in the time that was stated. I had soft potatoes but very tough roast meat. Did I cut the pieces to large? Flavor was great. Sorry to hear your meat didn't come out soft. You know, every cut of meat is different and sometimes they take longer to cook and get softer than others. Thanks for letting me know. I'll add a note to the recipe so other people do not run into the same problem. When i use a less tender kind of meat and i´m in a hurry, i put it with a Little bit of water first and let it boil and evaporate, once water evaporates i add a Little bit of oil and fry meat, that gives meat enough time to cook entirely and doesnt take much time. What’s the reason for straining tomato mixture before adding to meat? This recipe looks amazing, just curious why pulp is left out. Just custom, you can make add it without straining. I know new powerful blender do a great job now. Did you boill the tomatoes before blending ? The tomatoes are placed into the blender raw, then you process them to make a sauce and pour into the skillet. They will cook in there with the meat. Question: why chicken broth? I would think beef makes more sense….? Chicken broth is more used in Mexico, but you can use beef broth. My boyfriend used to make a stew which used stew beef potatoes and crushed tomatoes. He used a lot of black pepper and cumin. He would fry the potatoes as well as the meat. Add tomatoes and spices. This was along time ago. I remember the name of it was papas scaldudas spelling probobly wrong. Is this a real dish or was it something he just created. It was so yummy . We are no longer together and I never wrote down a recipe. I’m sure that was his own creation.